I've been in love with Amrut for a while. Recently I had a great tasting of much of the Amrut line at Whisky Live NY. Last weekend I reviewed Amrut Cask Strength and Amrut Cask Strength Peated and gave them five stars and four stars respectively. 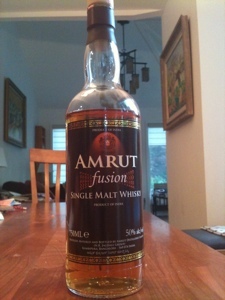 However I've had an unopened bottle of Amrut Fusion sitting on the shelf for months now. That had to end so I cracked it and have been dramming it all week. What's special about Fusion; what makes it virtually unique in the whisky world, is that it is made with both Scottish peated malt and also Indian unpeated malt. The combination of malts made on two continents and both peated and sweet was unique - at least, to my knowledge, until High West came out with Campfire (for that unique combination of US Rye and Scottish peated malt, See Tim Read's excellent post). Combining peated and unpeated malts should make the peat more subtle and produce a sweeter mix. Using Indian malt should add some more of the stunning Amrut spice scented flavor profile that it's hot tropical rapid maturation brings. "Interesting this one -matured for part of its life in India, then shipped over to Europe for the final three years. An interesting experiment, and one which makes us wonder if the reverse might not be coming soon (whiskies being shipped from Scotland to India to undergo accelerated maturation). Couldn't call it 'Scotch Whisky' of course, but who'd give a monkeys' if you could buy spirit from some of Scotland's most iconic distilleries 'flash matured' for 3 years in India's sunny climes? Just a thought." So, Amrut is, strikingly, making a dramatic impact all over the whisky world far beyond India's shores. This innovative spirit is well represented in Fusion's dramatically unconventional mash bill. Nose: Spirity sweet heat then dust, buttered toffee, creme broulle, nutmeg, vanilla, cardamom and a little bitter orange. It's a rich and inviting nose. Curiously missing is a sense of the peat. 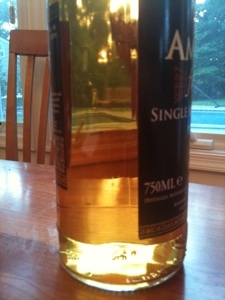 Entry is toffee sweet with Amrut's lovely characteristic honey, butter, toffee, ripe banana flavors. The mid-palate expands big with spicy black pepper and a rich butterscotchy malt foundation. The turn to the finish is dominated by oak, sandalwood incense, and some mild peat smoke which evolves on the palate to tar and ash flavors in the finish with tannins drying. 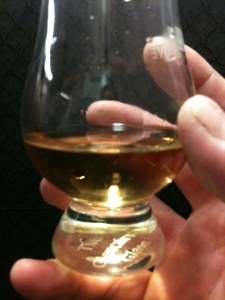 As you continue to sip Fusion the spiciness and peaty quality builds in intensity. Towards the end of the dram the fiery peat which began very subtly has become a powerful sensation and fiery peppery heat has your mouth buzzing as if you had eaten Vindaloo. This is pretty unusual. 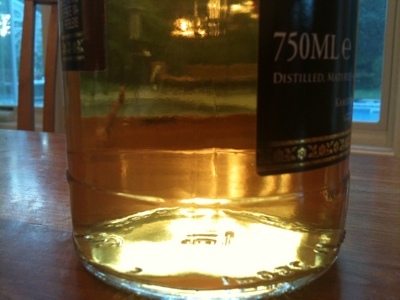 50% abv (100 proof US) is strong - but doesn't fully explain this fiery spicy quality. It's something special about Amrut peated expressions. A few drops of water ups the peppery and the dark in the nose. It also amps up the toffee banana sweetness in the entry and the mid-palate heat to Scotch Bonnet levels. The sweet and hot suits me. It's a lovely spicy dish with some subtle but very distinct sharp peat tar kick at the finish. Bottom line, a stunning dram that manages to seem almost sweet and mild at first; but is a wolf in sheep's clothing. It builds quietly, until later you realize that you are rocking to a monster flavor profile. It has a few rough edges, and isn't what you'd call "elegant" or "refined" - but it's a stunning new flavor profile that succeeds brilliantly.